A 284 foot waterfall! Need we say more. 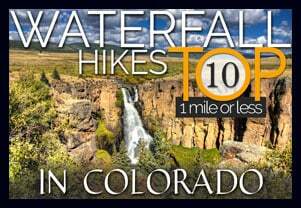 Fish Creek Falls is a 1/4 mile hike located just outside Steamboat Springs, Colorado–about 3.5 hours from Denver. The Fish Creek Falls Overlook trail is handicap accessible, and a second trail takes hikers down to the base of the falls. 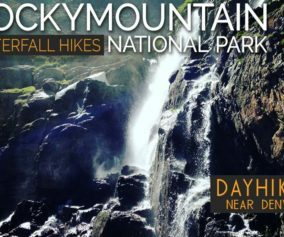 Explore the full Fish Creek Falls hike profile below for trail map, driving directions, and many the details you need to enjoy this adventure near Steamboat, Colorado. 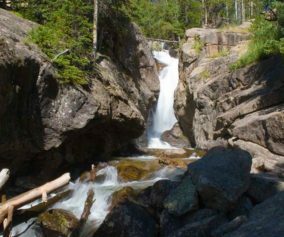 The trailhead for Fish Creek Falls is about three miles outside of the town of Steamboat Springs, Colorado. Stop at the pay station to purchase the day use fee. There are two parking areas: one will be on your left driving in, and the larger lot–which is closer to the trailhead–at the end of the road. 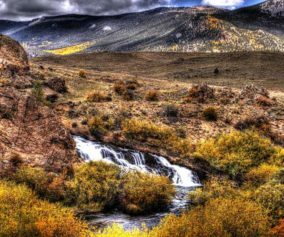 Fish Creek Falls is one of the most accessible waterfalls in Colorado, perfect for families with small children who are not yet able to hike longer distances. 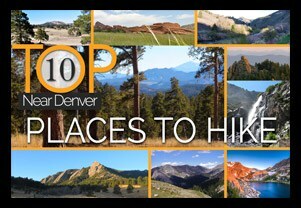 It’s also wheelchair accessible via the Fish Creek Falls Overlook Trail. There are three different options detailed below. Fish Creek Falls Overlook Hike: This 1/4 mile (one-way) hike leads to the Fish Creek Falls overlook. The trail is paved and handicap accessible. The most direct access to the overlook trail is from the northeast end of the larger parking area, near the interpretive signs and the small shelter. Fish Creek Falls Hike: This second option is also a 1/4 mile (one-way) and leads to the bridge at the base of the falls. The trail is gravel and dirt–not paved like the overlook trail. This trail begins at the far east end of the same parking lot. 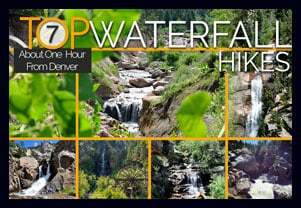 1 Mile Loop: Both the overlook and the Fish Creek Falls hikes can be combined to form a kind of 1 mile loop by hiking first to the overlook, then returning through the shaded picnic area to the Fish Creek trail below. After hiking to the bridge, return the way you came. 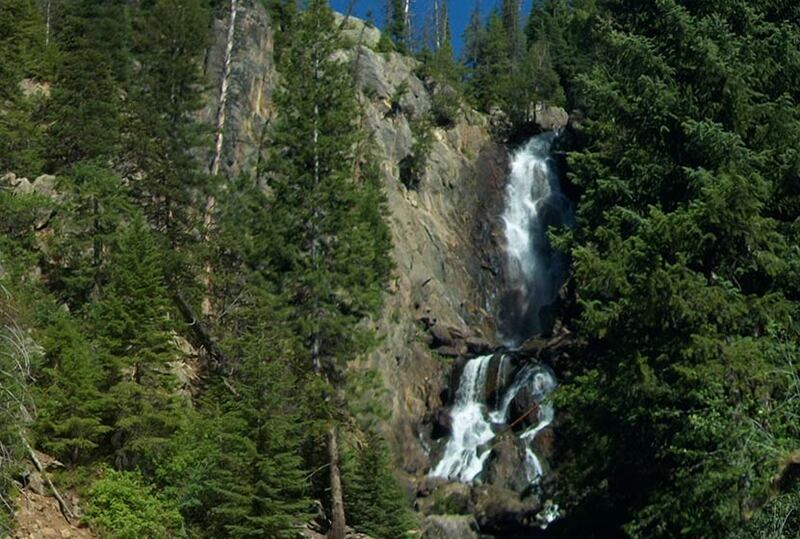 Bring a Picnic Lunch: The picnic area at Fish Creek Falls is one of the best in the State of Colorado. It’s extensive and the trees provide a ton of shade. Springtime is Best: Fish Creek Falls roars with the late Spring meltwater. In Winter: The trails to the falls are open year round. You may need snowshoes when the snow gets thick. Explore More: There is another waterfall. 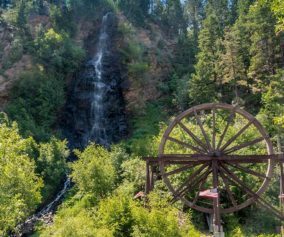 A short, but demanding, 2.2 mile (one-way) hike to Upper Fish Creek falls follows the trail beyond the bridge and another 1,100+ feet above the trailhead. Photo: We would like to express our gratitude to Greg Hamilton for sharing the photograph of this hike.